It’s been a little while coming, but once you get your hands on Vworp Vworp! Volume 3, there’s no question that the wait was more than worth it. Calling it a fanzine perhaps does it a disservice – nonetheless, this weighty tome celebrates Doctor Who Magazine, comics, and other artistic endeavours, made by fans of the show… including numerous contributors to The Doctor Who Companion! Volume 3 is a 208-page bumper special and you’re guaranteed to love it. Not only do you get brand-new comic strips but also an exclusive interview with Alan Moore. Published in Doctor Who Weekly and Monthly in 1980 and 1981, and featuring the Cybermen, the Autons, and the Time Lords, Moore’s strips were his very first professional work, and would go on to influence both comics and Doctor Who in ways he could never have foreseen. 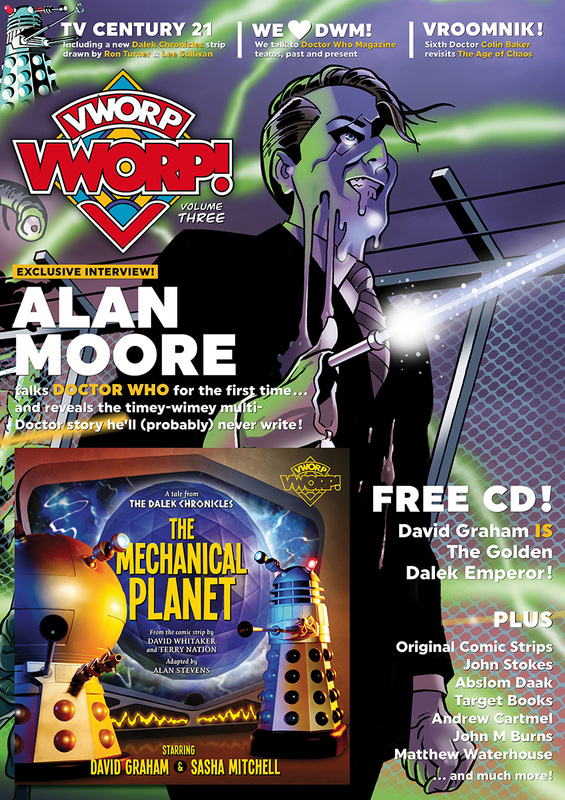 The writer further tells Vworp his idea for the ultimate Doctor Who TV story, and the magazine also talks to the artists who worked on Alan’s Doctor Who strips, David Lloyd and John Stokes. This volume also includes an awesome, exclusive free gift: A CD featuring a brand new full-cast audio play written by Kaldor City’s Alan Stevens, with sound design by Alistair Lock. 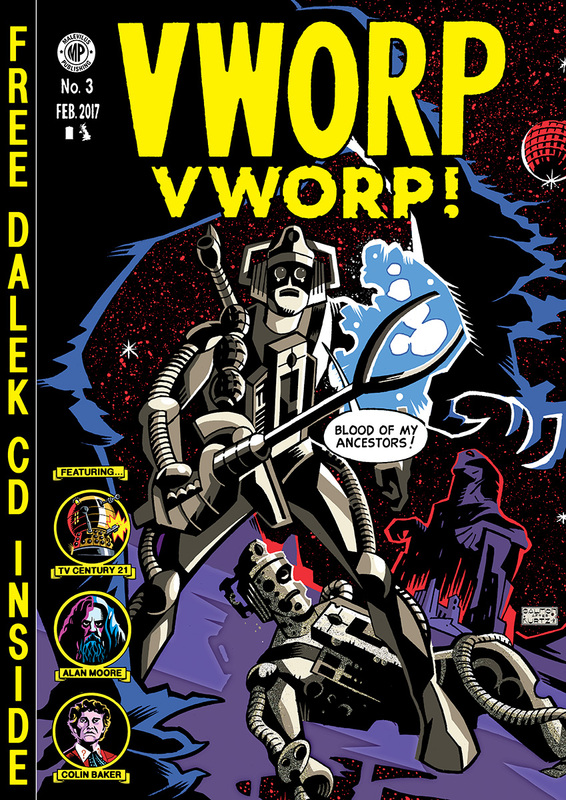 This one-off homage is available only with Vworp Vworp! and is inspired by The Mechanical Planet, a comic strip published in 1965. The play stars David Graham, beloved as Parker from Thunderbirds, and who, alongside Peter Hawkins, provided the original voice of the Daleks from their first appearance in 1963 through to The Daleks’ Master Plan. 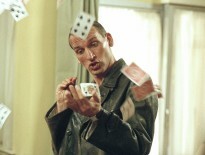 As the Golden Emperor of the Daleks, David voices a Dalek for the first time since 1966. The cast is completed by Sasha Mitchell, best remembered as Arlen, the Federation officer who brought down Blake’s 7 in the final shocking episode transmitted just over 25 years ago. The Mechanical Planet is only available with the magazine on CD and, for a lucky few with the TV Century 21 issue cover, a proper vinyl 7-inch record, created in homage to the brilliant 1965 Century 21 record that featured highlights from the final episode of The Chase with narration by David Graham. I know. You wait for so long for a PodKast then two come along on one day. THE DALEK CHRONICLES RETURN: Deadline to Doomsday, an exciting 7-part Dalek strip, was begun by the late artist Ron Turner in 1997 and completed seamlessly for Vworp Vworp! by Dalek artist supremo Lee Sullivan and Charlie Kirchoff. BRAND NEW COMIC STRIPS: We add a bittersweet coda to TV Century 21’s Robot Agent 2K, showcasing the work of writer Tim Quinn and artist Tim Keable. We also have the stunning multi-Doctor epic The Woman Who Killed the Doctor, written by Daniel O’Mahony and drawn by Steve Andrew, and The Lawman, an authentic Doctor Who Weekly-style back-up strip penned by John Peel and drawn by Baz Renshaw. TV CENTURY 21: Prolific science fiction author Stephen Baxter (The Massacre of Mankind; Doctor Who: The Wheel of Ice), together with Alan Stevens and Fiona Moore (authors of The Unofficial and Unauthorised Guides to Blake’s 7/The Prisoner/Battlestar Galactica) lead us through an in-depth analysis of these extraordinary Dalek strips and their close cousins in the much-loved 1960s and 1970s Dalek annuals. We profile the artists, Richard Jennings, Eric Eden and Ron Turner; while Tat Wood put the strips in context with a detailed examination of Dalekmania in general; horror author Stephen Laws and Doctor Who historian Jeremy Bentham remember growing up during those exciting years; plus Matthew Sweet on TV Comic and David Quantick reflects on canon. TARGET BOOKS: Remember the thrill, the smell, the feel of a brand new Doctor Who novelisation? Dalek operator, Nicholas Pegg does, and salutes the people behind them. THE AGE OF CHAOS: We journey back to 1994 to explore the creation of this memorable Marvel one-shot penned by the Sixth Doctor himself, Colin Baker, with exclusive interviews with Colin, editor Gary Russell, and artists John M Burns and Barrie Mitchell. 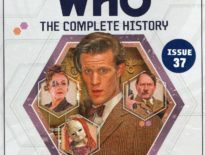 DOCTOR WHO MAGAZINE EDITORS INTERVIEWED: Featuring John Freeman, Gary Russell, Marcus Hearn, Alan Barnes, Clayton Hickman, Peter Ware, and Tom Spilsbury in conversation. BRIEF ENCOUNTERS: We also chat about Abslom Daak with Richard Starkings, Lee Sullivan, Paul Cornell, and Ben Aaronovitch; Halo Jones with Andrew Cartmel; investing in Doctor Who Weekly with Matthew Waterhouse; and illustrating the very first Dalek novelisation with legendary Hollywood graphic designer Arnold Schwartzman and Armada artist Peter Archer. 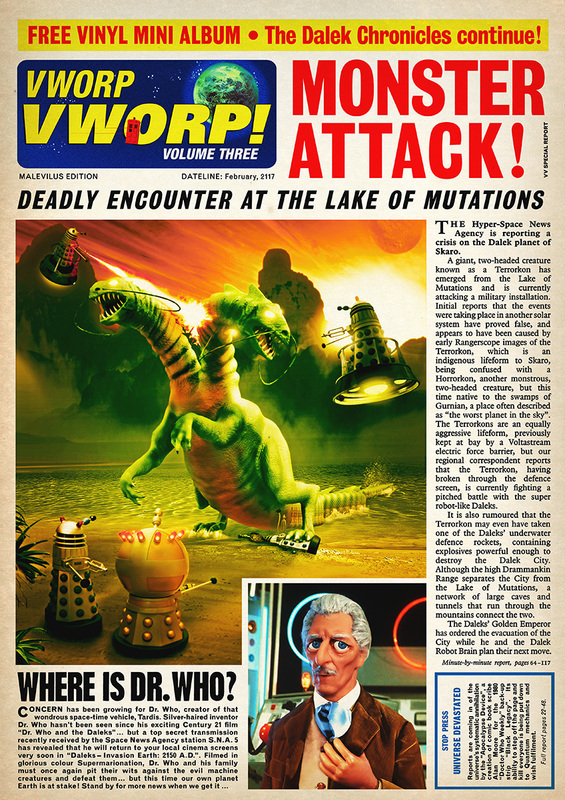 The magazine is available with three variant covers, one by Martin Geraghty, another by Adrian Salmon, and the TV Century 21 one (with the vinyl), featuring ‘Terrorkon’ by Gavin Rymill, ‘Dalek Models’ from Phil Stevens, ‘Hoverbouts’ by Andrew Orton, and ‘Thundercushing Head’ by James O’Neill. The latter one is currently sold out while the makers do a stock-take, so keep an eye out for that! Vworp Vworp! Volume 3 is available now, for £9.99, and can be ordered from the official site. Come back to the DWC soon for a look at some sample pages, and because we’ll be celebrating the fanzine properly… with a full week devoted to it!